I mentioned in the last post that I went to NYC with some high school friends earlier this month. 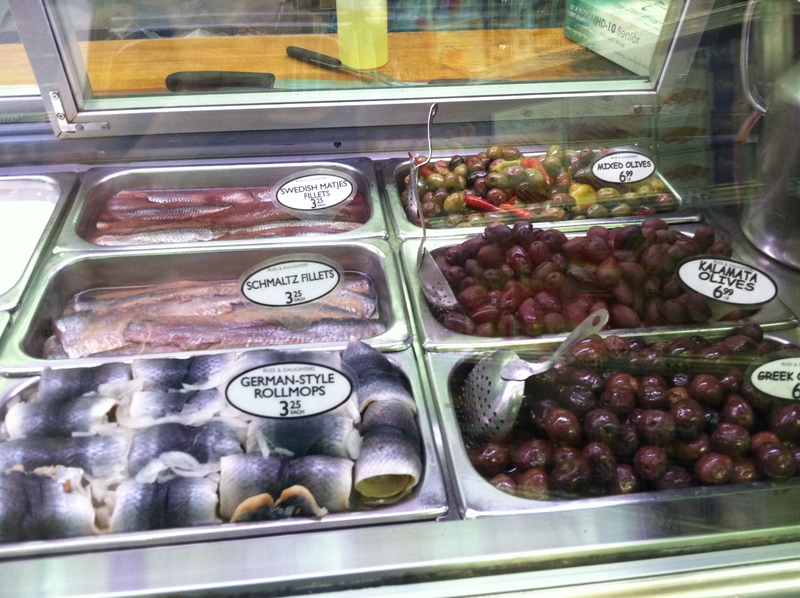 One of the highlights of the trip was our impromptu stop into Russ & Daughters, a little hole-in-the-wall place that just happens to be NYC’s “premier appetizing shop.” It’s like a bagel joint and a gourmet food store in the same place. 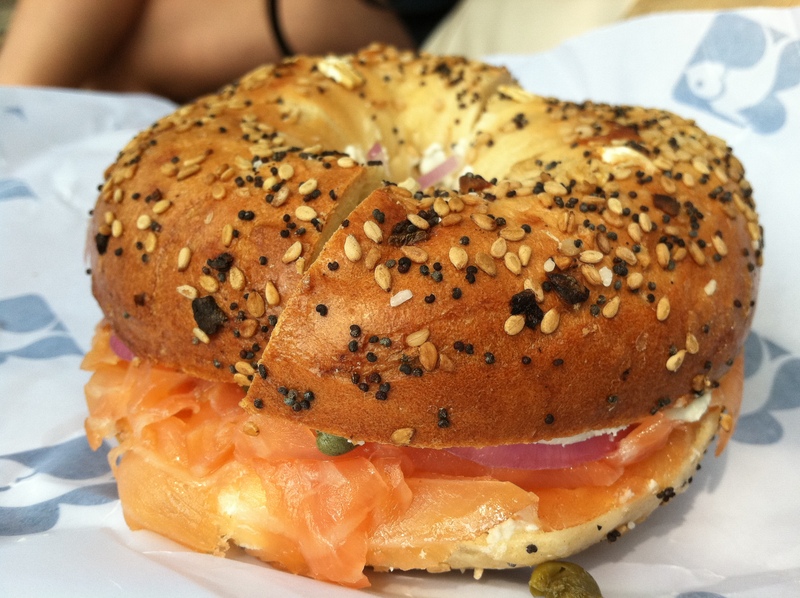 We happened upon it because we woke up craving Lox bagels. Using my new iPhone, I was very proud of myself when I was able to google “lox bagel, nyc” and zoom in on the map to the lower east side – just the part of town we were hoping to explore that morning. Purely by chance, I think, Russ & Daughters appeared and we were on our way. If I had been a little more tuned in to reality, or in to anything other than my I-need-LOX-now mindset, I might have remembered that this place was featured on an episode of Bourdain’s No Reservations… but no, I had to wait until after our trip, after I was back home in ATL, to figure that out. 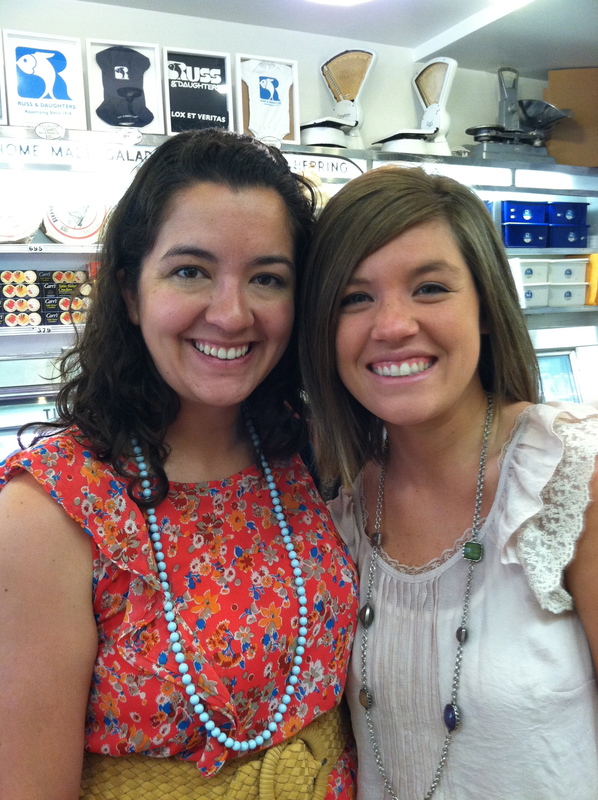 The shop is actually quite famous… it’s been around since 1914, and has been a regular stop for foodies ever since. You’d think it would ring some sort of bell… but it didn’t. It was probably for the best that I walked in there with no idea what it was, or no knowledge that it was anything other than another bagel joint… because then I might have expected too much, or something different altogether. I walked in there craving bagels and smoked salmon, and was immediately overtaken with a childlike excitement. All three of us (me + Mary and Jennifer) had that excited feeling you get when you think you’ve found a diamond in the rough. We thought we’d stumbled upon a hidden gem, a never before publicized spot…a little New York shop full of amazingness that no one else seemed all that excited about. But we were excited – maybe even a little too excited. We (I) took pictures like tourists and oohh-ed and ahh-ed over the food. My bagel-maker-man, who I’m assuming is a member of the Russ family, took SO much care in making my bagel. He didn’t do it with southern sweetness, (in fact, he was a little gruff) but whatever… he sliced my bagel so carefully, then he slowly cut little slivers of perfect salmon and laid them evenly over the cream cheese. Then, when I asked for red onion and capers, he broke the onion rings apart and made a little design on the salmon, into which he carefully placed the capers so they wouldn’t roll out… I couldn’t believe it. my bagel-maker-man, and my bagel! I feel like usually when you go to a bagel shop in NYC everyone is moving so fast you’re lucky if you get everything you asked for and have time to pay for your bagel before another hungry New Yorker nudges you out of the crowded shop. But not here. Each bagel was a masterpiece, and I was practically drooling on the glass case as I watched his careful preparations. had it not been 10am, I would've had some olives, too! Every single bite was unspeakably good. I really just can’t even explain how tasty it was. 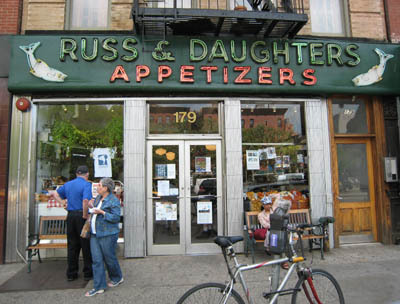 If you ever find yourself in Manhattan’s Lower East Side, please visit Russ & Daughters. Even though you pay more than seems reasonable for breakfast (mine was around $10), your first bite will convince you that you made the right choice. ← Pizza and Malawi Sugar! 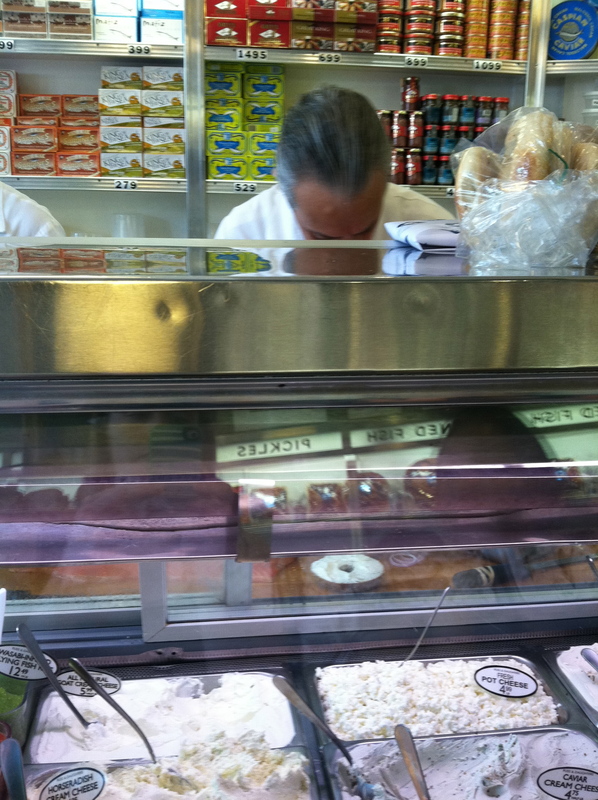 One of my favorite places in NYC!–Just down the street from Katz Deli. 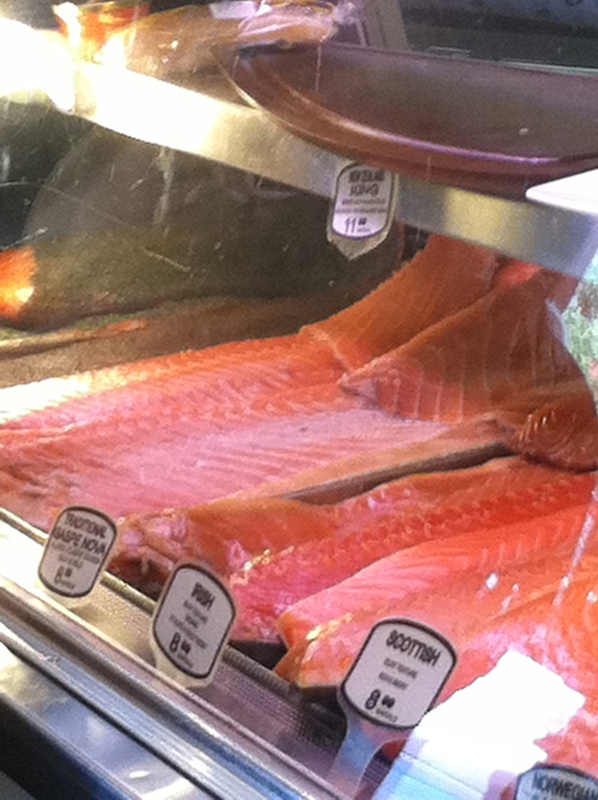 Loved Russ & Daughters! Your writing makes me want a bagel now!